Wooden Ships, the song performed at Woodstock by Crosby, Stills, Nash and Young and featured on their first album, may well be remembered by many members of our generation. The ballad came to our baby-boomer minds when we first viewed the magnificent wooden yachts and fishing boats in various stages of construction, tear-down and refurbishing. 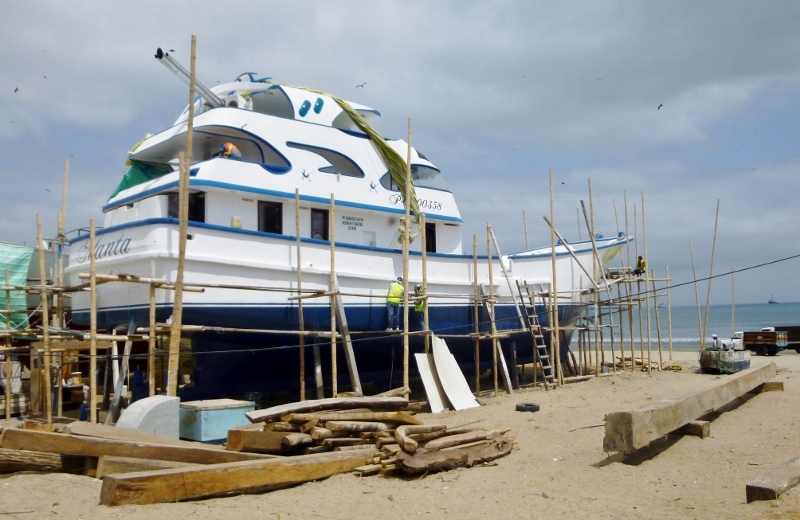 All the overhauling and building is taking place in dry dock on the sands near Playa Tarqui here in Manta. There does not appear to be a great deal written about these craftsmen or the work of the shipbuilders on the beach adjacent to the fish market. 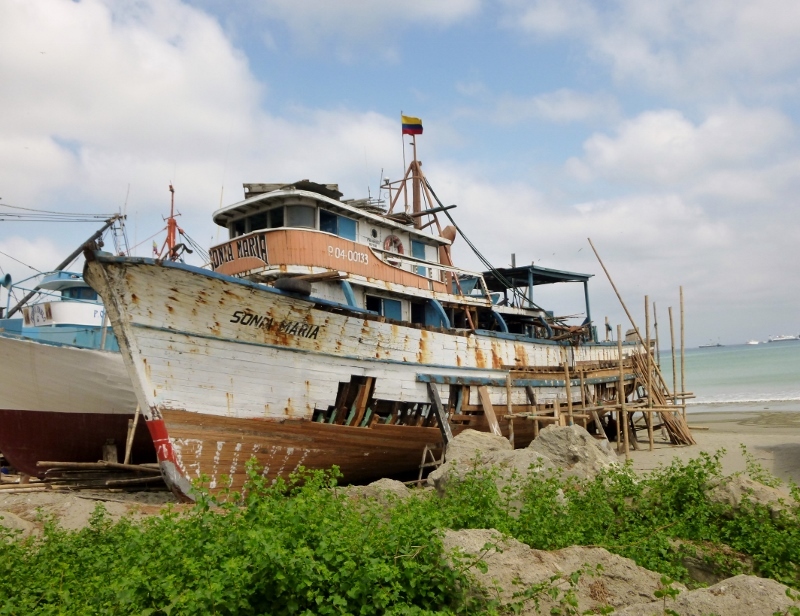 Manta, with an estimated population over 300,000, still feels like it’s not much more than an overgrown fishing village although it’s now a major exporter of tuna and other seafood within which a financial sector has flourished. So it’s logical to assume that the profession of building wooden ships has been known and practiced for generations, if not for centuries. The current craftsmen still rely on hand tools. Chisels, hammers, adzes, awls, knives, machetes, nail sets and the like are wielded to work the wood to create ribs, hulls, decking, super-structures, etc. Some of the wooden beams and planks are machine milled but not to uniform dimensional lumber. The individual boards are selected one by one, measured and cut separately to match the adjacent plank and the gaps between are sealed by caulking. The beam and ribs are chosen for the grain with a natural bend being required and are slowly shaped so the main supports, to the extent possible, are intact pieces of lumber and not ones “sistered” or jointed. 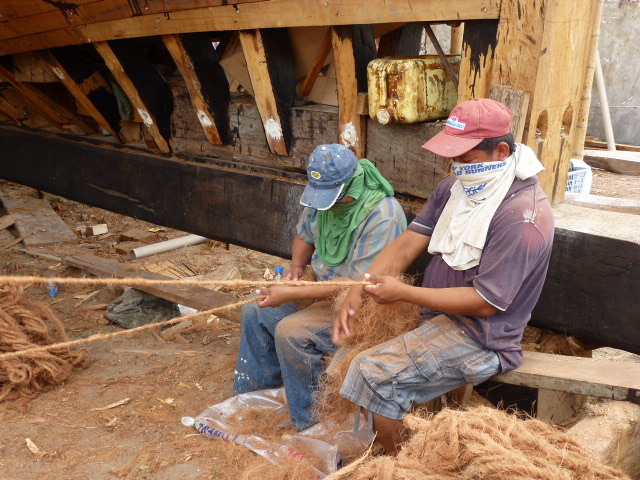 To seal the spaces between the planks, the fibers of de-husked coconuts are used. These tough strands are roughly woven into a fibrous rope held taut between two men while being worked to form a sinewy caulking that is later covered by water repellant sealers. As a concession to modernity, a limited assortment of power tools are used in the construction including small chain saws. Some of the wooden ships and yachts, which are covered in fiberglass, require powered grinders and buffers for a finished application. These, alongside the Asociacion de Carpinteros de Manta of which the craftsmen are members, show that this native industry has kept pace with the times. It’s been decades since the release of the song Wooden Ships; we’ve aged and changed and could even use some refurbishing of our own. And yet we have little reason to believe that much has changed here on the beach in Manta. Certainly the fiberglass coverings, the chainsaws and the associated electrical accoutrements are a more recent addition. But it’s not hard to imagine that the profession of building ships is passed down through the generations from father to son. And there’s much to be said for the refurbishing of those ships that have been used well and meticulously restored to their former incarnations allowing them to go to sea once more. Special thanks to Al Eisele of mantaexpatsonline.com for permission to use his photos. 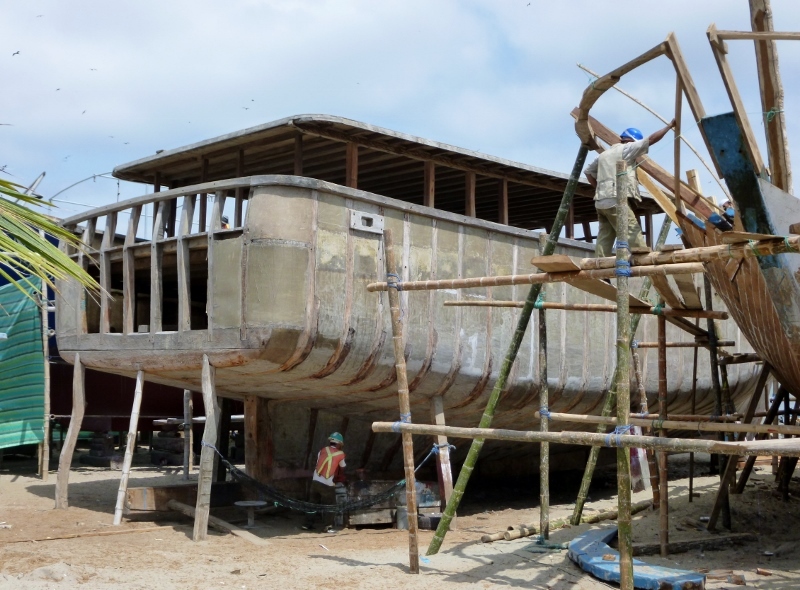 BOAT BUILDING RIGHT UP MY ALLEY—I LIKE IT–MIGHT HAVE TO GO BACK TO S. AMERICA FOR THIS AND MACU PICCHU. BY THE WAY IS THE ON-LINE OFFER FROM “INTERNATIONAL LIVING” SERVICE FOR $99 ANY VALUE—OR WHAT WOULD BE SOME GOOD RESOURCES FOR HOTELS, HOUSE SITTING AND AIR TRAVEL ADVISE. HOW MUCH LONGER IN EQUADOR OR IS THAT A TRIP IN THE PAST? WHERETO NEXT….PORTUGAL? Hi Ed. 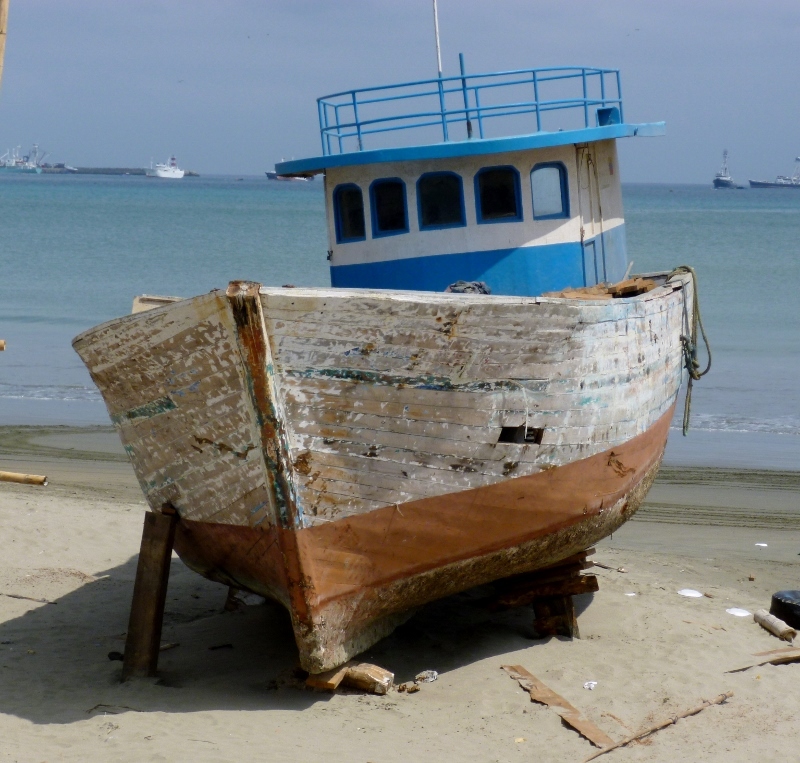 Glad you like this post on the traditional boats of Manta – definitely one of your interests! They are beautiful and it’s fascinating to see them being built. Ecuador is several countries behind us and now, a year down the road, we’re anticipating a return to Portugal. We’ll email you to answer your other questions and thanks for stopping by! Hi guys.. Started at EduPlus on Monday.. Yesterday one of the boys, Felix, realized i had been to the beach with them, si, con Professora Joanna y Ricardo……. ¿DONDE ESTA RICARDO? I showed him on the globe where you were, but I dont think that meant much to him!! Funny!! Aw! Makes us miss everyone so much at EduPlus! “Ricardo” had a special soft spot for all the boys in our classes and I think they enjoyed having a male teacher, too! 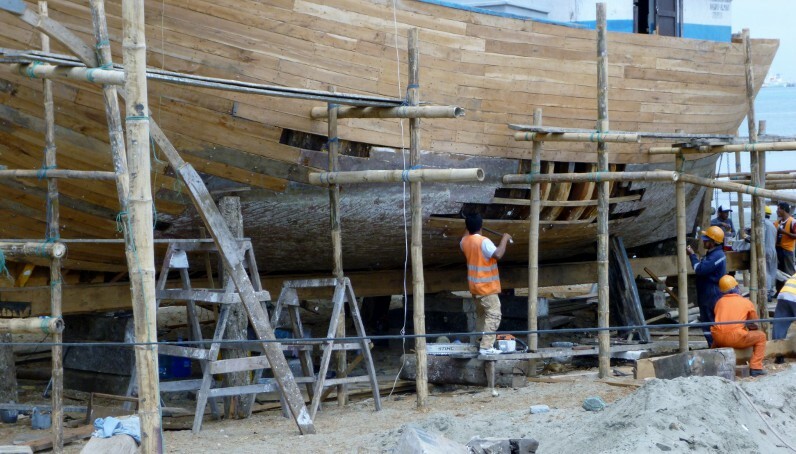 What an interesting glimpse into the craft of building wooden ships! We’re so glad you enjoyed it. We loved the time we spent watching these craftsmen work on these beauties and it was fun to write and share the post with readers. Impressive craftsmanship – the work that goes into these ships is fascinating. Thank you for this informative post. We were amazed when we first saw this magnificent ships and are still puzzled why there isn’t more written about these beauties and the people who make them! So glad you enjoyed the post. 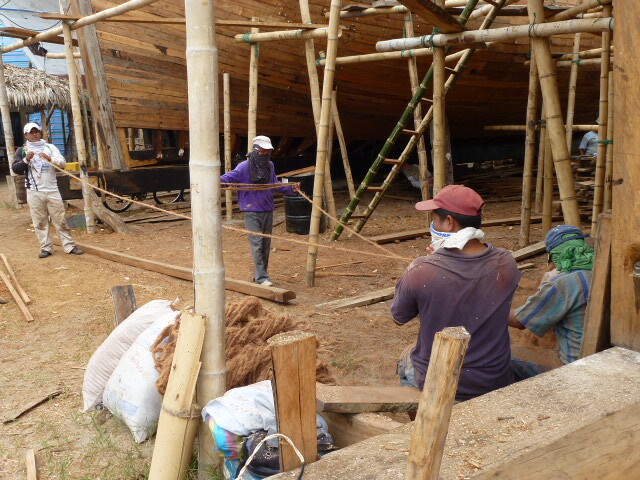 Wood ship building is an art. It must have been fascinating to see it in progress. We went back a few times to see the progress and hope to make a few more visits before we leave this area. The fact that very few tools are used in the building process is one of the most interesting things about the building as well as the individual selection and cutting of each board. Time just isn’t a factor which is definitely a foreign concept for us northerners! Now I’ll have an earworm for the rest of the day – one of my favorite CSN songs. Such masterful craftsmanship. Who knew about coconut fibers! 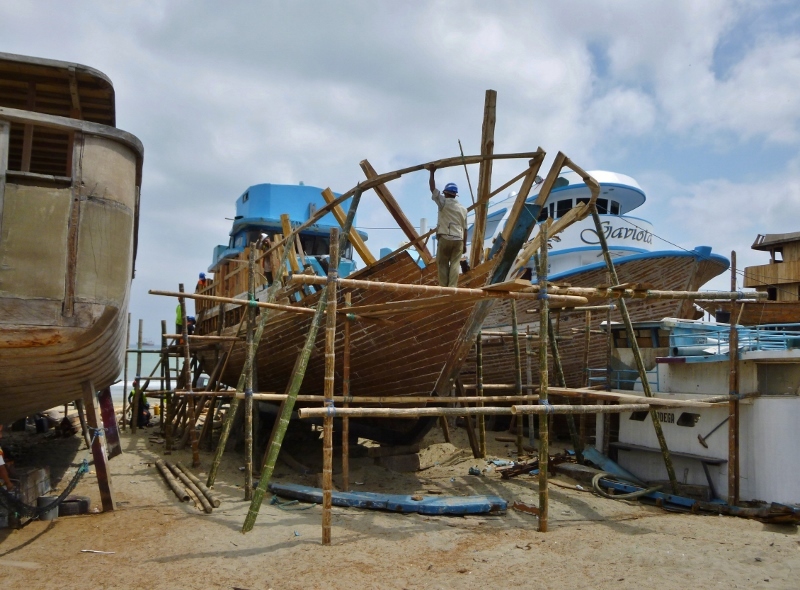 So much craftsmanship goes into ship building – loved seeing this post. All of the ships were beautiful with the skill that goes into renovating and constructing the sleek new boats, the bruised ships under renovation and the totally battered ones awaiting overhaul with their histories of usefulness, missing boards and muted colors. What an interesting spot to explore – thanks for taking me along! 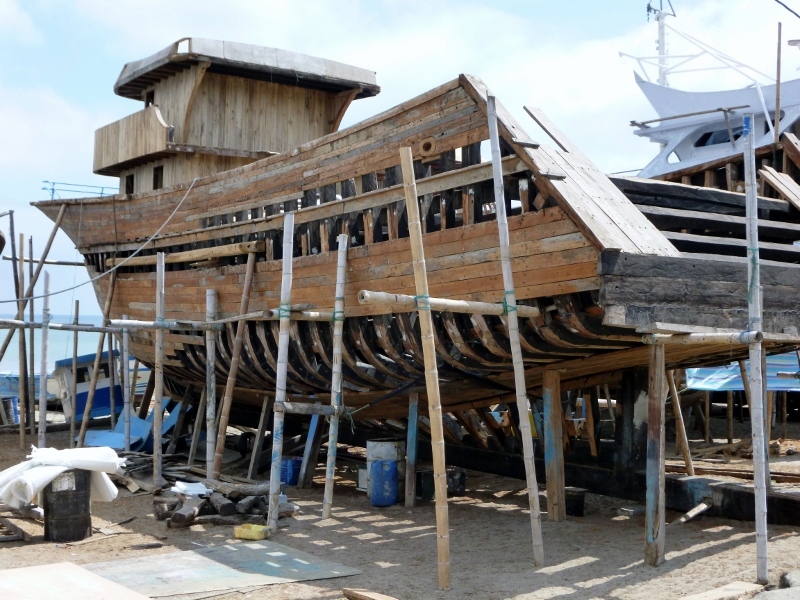 They actually build very sturdy wooden ships in Ecuador, as we experienced on our trip around the Galapagos, where the waves were “hammering” the underside of the five cabin cruiser for hours. Anyone on a ship wants it to be strong, that’s for sure, especially in a place like the Galapagos so that you can tell the tale of the experience! Too bad the boats don’t have a remedy for the seasickness, though! Thanks for showcasing the work of these talented artisans. It is amazing to watch the craftsmen working slowly, board by board and know the patience and persistence that goes into each boat. No hurry … the boat will get done when it’s done! The fact that you look forward to our posts is the loveliest compliment ever! We can’t say with certainty the amount of time that goes into building a ship since there are so many variables – we heard one estimate of a year. But we were told that there’s a huge celebration with plenty of libations when one is finished as you can imagine! Thanks, Hugh. 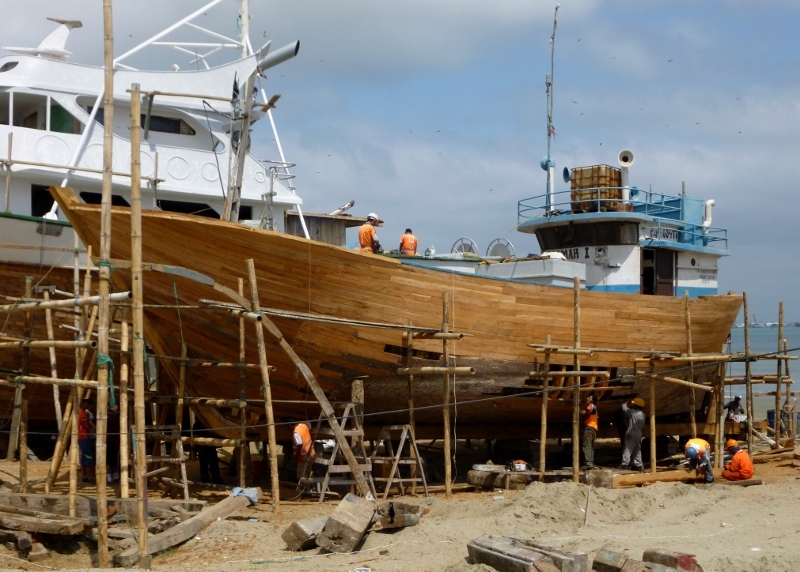 We’d heard from friends who live in Costa Rica that watching the wooden ships being built was one of their favorite things about their Manta visit and we have to agree!